Whether you live on a farm or you have a house with a back yard in the city, a shed is a great way to add storage space to your property. While it is most commonly used to store maintenance equipment such as lawn mowers, pruning shears and snow shovels, a well-constructed structure can be used for all types of storage. Properly sealed and insulated, it can even be used to store electronic equipment or boxes of books and can be a cheap alternative to renting a storage locker. While buying a shed can be expensive, the building materials are not. 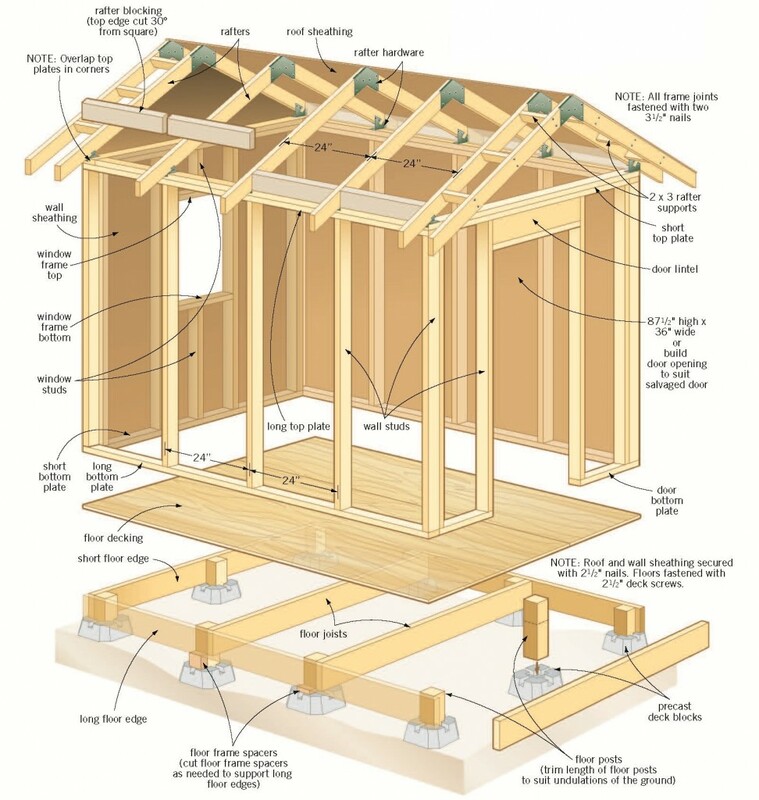 With a good set of shed building plans, you should be able to build your own with a minimal amount of cost and hassle. There are a number of things to consider when trying to choose the right DIY shed building plans. First, you must think about what kind of structure you want to build. If you want an easy place to store landscaping supplies, you will probably be fine buying plans for a basic model, with four walls, a roof and a floor. If you want to store electronics, books or paperwork, you will want to find instructions that include waterproofing and insulation. You want to make sure that your belongings are protected from the elements. You may also want to find instructions that include added security features such as lockable doors or tamper-proof windows. While the main purpose of a storage shed is functionality, you should also consider how it would fit into the total look of your yard. Good shed building plans will include a picture of the finished product, so you can see what it looks like. If you have a rustic yard with overgrown flower gardens, a traditional, farm-style structure will probably fit right in. If you have a modern yard with carefully manicured rock gardens and fish ponds, a sleek, minimalist design might suit you better. You should also try to find plans that can be altered to build different sized buildings. This way, you can assess how much storage space you need and how much space you have in your yard, and build the shed accordingly. The final thing to consider when choosing shed building plans is your own limitations. If this is your first attempt at a building project, you should choose simple instructions that are suitable for a beginner. If you have built a few things before, you may want to attempt a more extravagant project. Also, consider your access to supplies. While most storage sheds do not require anything that you cannot buy from the local hardware store, it is still a good idea to read through all instructions carefully before you begin. Make a list of the supplies needed and give the hardware store or lumberyard a call to double-check that they have everything available. Once you have chosen your design, it is time to get started. Get your supplies, plan where you will build the shed and begin construction. If you are an experienced builder, you can play around a bit with the instructions, adding extra features and customizing the features that are already there. If this is your first project, however, it may be best if you stick to the instructions laid out in the shed roof building plans.